These newlyweds are in for a big surprise in this delightful holiday novella from the USA Today bestselling author known for her "unputdownable contemporary romances" (Booklist). Jay never wanted to be a father. In fact, he's avoided it his entire life, worried he'd repeat the patterns of his own messed-up childhood. He's madly in love with Elise and, until now, he thought they were on the same page about not having children. But her surprise pregnancy changes everything. Elise is suddenly committed to parenthood, and Jay knows he can't lose her. Facing his deepest fears will be difficult, but with a little holiday magic, Jay might be able to prove to Elise that – as a family – they're destined to live merrily ever after. A cute read about what happens when something you didn't expect or know that you wanted. Life is about to change drastically for Elise and Jay when Christmas brings Elise a true miracle: an unexpected pregnancy. She's not sure how she feels, she's been told for years that having children weren't in the cards for her. She's scared to tell Jay because he's been very clear about not wanting kids. I loved the way Elise and Jay's feelings were explored, the emotional angst that each went through to discover how they truly felt about being parents. Jenny Holiday is a USA Today bestselling author who started writing at age nine when her awesome fourth-grade teacher gave her a notebook and told her to start writing some stories. That first batch featured mass murderers on the loose, alien invasions, and hauntings. (Looking back, she’s amazed no one sent her to a shrink.) She’s been writing ever since. After a detour to get a PhD in geography, she worked as a professional writer, producing everything from speeches to magazine articles. Later, her tastes having evolved from alien invasions to happily-ever-afters, she tried her hand at romance. She lives in London, Ontario, with her family. 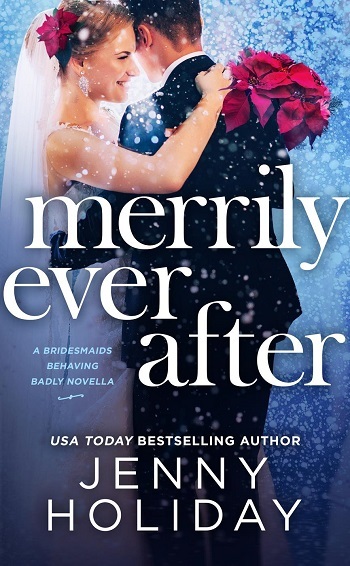 Reviewers on the Wicked Reads Review Team were provided a free copy of Merrily Ever After (Bridesmaids Behaving Badly #2.5) by Jenny Holiday to read and review.